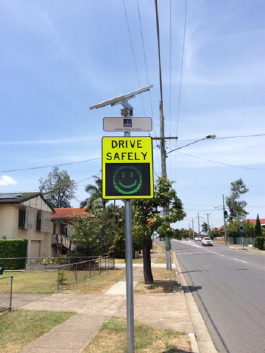 Brisbane City Council's Portable Speed Warning Signs Project is aimed at making Brisbane's streets safer. This initiative aims to promote safety through driver awareness and minimise speeding on neighbourhood roads. This will be achieved through the use of portable speed warning signs at various locations throughout the Moorooka Ward. * if the motorist is driving above the posted speed limit by up to 9km/hr, the vehicles speed is displayed below a ‘SLOW DOWN’ message. The project has had positive results with passing motorists reducing their speed typically by 10km/h. We currently have a sign located in Oxley Road, Oxley. 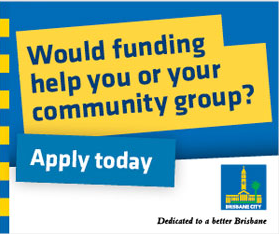 Brisbane City Council's grants programs provide funding to help local not-for-profit organisations to develop and improve facilities and services in Brisbane. The Housing Support Program provides funding to community organisations for projects or services that respond to the housing and social needs of homeless people, or those living in social housing, within the inner north of Brisbane. Funding amounts range from $2000 to $10,000. Applications close Monday 13 February 2017. The Men's Shed Grants Program supports men's shed groups in Brisbane. This program supports men's sheds by providing funding for establishment and coordination expenses, facility improvements and equipment and material purchases. Funding ranges from $2000 to $20,000. The Community Development and Capacity Building Grants encourage projects that respond to local and city-wide community issues with objectives including, but not limited to, increasing community identity and connections, increasing social inclusion and building the community sector to respond to community issues and needs. Funding amounts range from $2000 to $10,000. Applications close Monday 20 February 2017. Brisbane City Council's Healthy and Physical Activity Grants provide funding to local non-profit community groups for projects to increase participation in community sport, recreation and physical activity in Brisbane. Funding amounts range from $5000 to $20,000. Applications close 27 February 2017. Council's School Sport and Recreation Facility Upgrade Program is funded by Council and the Department of Education and Training. It provides financial assistance to Brisbane states schools to fund the upgrade of existing school sport and recreation facilities to increase community and school use. Funding amounts range from $5000 to $30,000. Applications close Monday 20 March 2017. For further information on any of these grants, visit Council's website or phone 07 3403 8888 and ask to speak to the Grants Unit. Is your home ready for the storm season? I recently attended the launch of the new community space created by the Bendigo Bank - Acacia Ridge Community Bank Branch and the Brisbane City Council at the the Elizabeth Street shopping centre. Council will be installing 'Wildlife Awareness" signage at all official entry nodes into Toohey Forest/Mayne Estate and Wilcox Park. 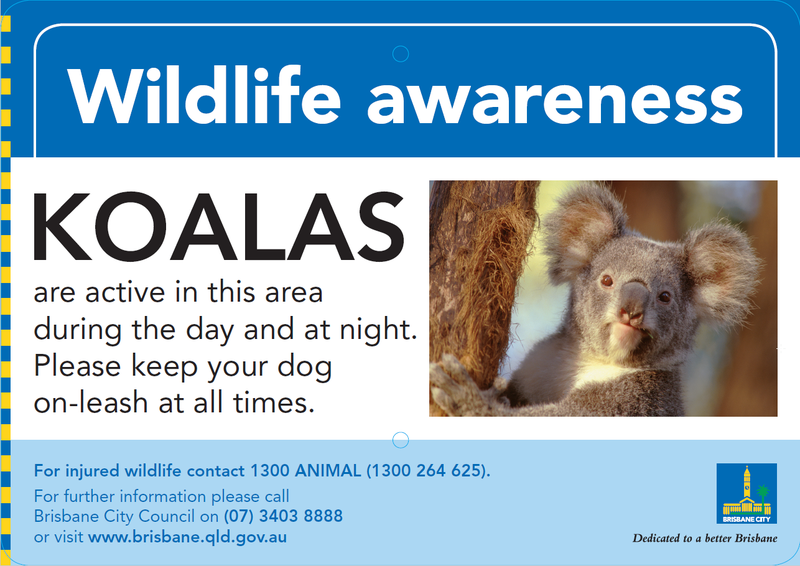 The signage is to inform park users of the presence of koalas in the reserve and importance of keeping their dogs on leads. 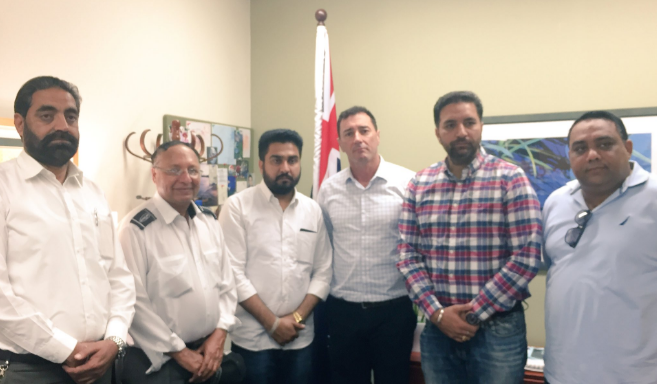 I recently met with Amit Sharma, and other members of the Punjab community. We discussed ways to remember his brother, Manmeet Sharma. A fund has been established to support the family of Manmeet. Get ready for storm season. Council's resource recovery centres will be accepting green waste for free this weekend, Saturday 22 and Sunday 23 October 2016. Order your green waste recycling bin by 31 October 2016 and Council will waive the $30 establishment fee. I have had a few enquiries lately about why Moorooka doesn't have a dog off-leash park. Over the years we have investigated a number of park areas in Moorooka for a suitable dog park site.